This year's inaugural Advocacy Summit takes place October 25-26 in Baltimore, MD and will bring insight into the latest trends and threats to our industry. Our Vice President of Destination Products Management, Jim McCaul, had the opportunity to interview Amy Walter, National Editor for The Cook Politcal Report before the Summit. You have a long and established career in the political arena. Do you remember what got you interested in politics in the first place? Amy: I didn't come from a politically active family nor was I one of those Alex P. Keaton type kids who ran for office in grade school. I majored in Government in college and then got a couple of great internships that introduced me to the world of Washington and politics. I got hooked and, like so many folks in DC, wasn’t able to shake the addiction to politics. We hear so much about political polarization. Are there issues or matters that the American general public agree on that can be used as a unifying tool? Amy: The reality is that we agree on more than we disagree. What's driving polarization isn't all ideology or issues, it's fealty and loyalty to our "tribe." We take our cues on how to react to issues/ideas from the party with which we most closely identify. If one hears a statement they agree with, but find out that it came from a person they disagree with, they will suddenly find a reason to discount it. The irony is that though we are less identified with party than ever (more people ID themselves as independent than Democrat or Republican), we are more partisan than ever. What are the motivating factors that drive people to vote on a particular issue? Amy: Your lived experience is the most important driver for how you respond to and relate to certain issues. If you grew up in a rural area, you have a different appreciation/concerns about issues than someone who has spent their entire life in a city. If you grew up in an immigrant community you have a different view on certain issues than someone who has never met anyone who is not native born. Of course, over time, the issues that matter most to us change. We are more concerned with schools when we have kids of school age. Social Security becomes more important to us at age 55 than age 25. What motivates politicians to take a stand on a particular issue? Amy: Like voters, politicians are shaped by their lived experiences. More and more, however, their voting behavior is also being driven by partisan loyalty. With fewer moderates in Congress, there are fewer members who are willing to cross the aisle and participate in meaningful bipartisan work. The incentive structure rewards conflict over compromise. This is especially true on the Republican side where big donors and special interest groups have challenged incumbent members who they feel have not voted "appropriately" on an issue important to them. What does the math look like for the 2018 midterm elections? Do the democrats have enough momentum to win back the House or Senate? Amy: Democrats need to net 24 seats to win the majority in the House and three seats to take control of the Senate. The challenge for Democrats isn't momentum, it's geography. At this point, Democrats have enthusiasm and intensity on their side. More Democrats than Republicans say they are "extremely" or "very interested" to vote in 2018 (44 percent to 34 percent in the most recent CNN poll). But, Republicans have a geographic advantage. There are very few Republicans who sit in vulnerable House seats. Just 23 Republicans represent a district that was won by Hillary Clinton in 2016. A combination of gerrymandering and "self-sorting" (Democrats tend to cluster in and around urban areas while Republicans are more evenly spread out in rural, suburban and exurban areas), adds to the Republican geographic advantage. In the Senate, the geographic advantage is even more pronounced. Democrats have to defend 25 seats in 2018 - 10 of which went for Donald Trump in the 2016 campaign. Five of those ten seats were carried by Trump by double digits. These include states like North Dakota, West Virginia and Indiana. Meanwhile, Republicans only have to defend nine seats next year. And, only one of those states, Nevada, was carried by Clinton. The other eight were won by Trump. What is a political trend or issue that isn’t being talked about enough in the media that people should be paying attention to? Amy: We spend a lot of time talking about Pres. Trump's impact on politics, but we don't spend enough time talking about he was a reaction to - instead of a cause of - our current political times. We are living in an era of disruption - not just in politics but in every facet of our lives. This is true across the globe as well. The institutions and policies that worked in the 20th Century are simply incapable of taking us through the 21st Century. One last fun question, where is your favorite place to travel and why? Amy: Great question! I love Colorado, especially in the summer. It is a state that loves outdoor play as much as I do. Plus, they really take pride in their beer making. Another plus for me! 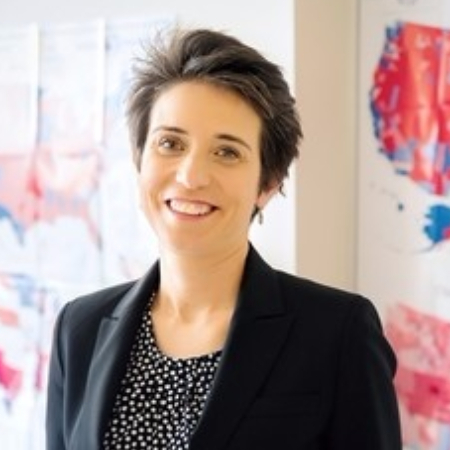 Over the past 14 years, Amy Walter has built a reputation as an accurate, objective, and insightful political analyst with unparalleled access to campaign insiders and decision-makers. Known as one of the best political journalists covering Washington, she is the national editor of the Cook Political Report and the former political director of ABC News. From 1997–2007, Walter served as senior editor of the Cook Political Report. She is a regular panelist on NBC’s Meet the Press, PBS’ Washington Week with Gwen Ifill, and Fox News’ Special Report with Bret Baier, and can also be seen on Face the Nation and Fox News Sunday. She provides political analysis every Monday evening for the PBS NewsHour.